We've taken a big step here at Minnow Creek Lane. I clean chicken poop now. And chickens poop a lot. Add that to my resume. Sells well on Wall Street. Living in Manhattan did I ever dream of chickens? I can't say that I did. Maybe hot wings with bleu cheese dressing. Never the live kind. But here on Orcas, where everyone raises chickens, things are different. We have a stable, begging to be used for something other than Gerry's second shop, and I don't fancy myself a horse lady, despite looking quite at home in a pair of riding boots. Chickens seemed like the natural introductory choice for a couple of city slickers. Easy, right? 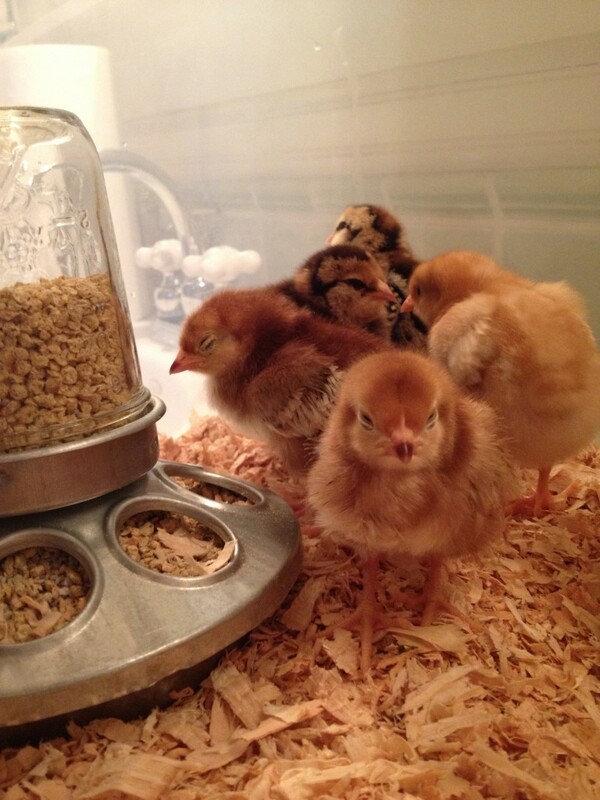 We picked up 6 beautiful tweeting chicks the Sunday prior, the last stop on a whirlwind Seattle weekend trip. It was more or less an impulse decision but we work best that way (that is why we live on an island that requires a ferry to get off of). We figured if the store was open when we drove through, we'd get chickens, if not, we wouldn't. The store was open; it was go time. We had NOTHING ready. Arrived home after 7pm and got to work on a makeshift brooder (literally, we googled 'makeshift brooder' and got to work). Friends had lent water and feed supplies and a heat lamp. Gerry scratched up our countertop cutting wire for the sake of the bird's ventilation. I made a feeder out of a yogurt container until I had a brooder big enough to fit the borrowed one. The heat lamp was broken so we rigged up a shop light. We worked until after 10pm. Finally, we had the birds cozily situated in a plastic bin on the counter in our warm spare bathroom. Tweet, tweet, tweet. G lay passed out snoring on the bed and I sat on the edge, looked at my anxious dogs, and felt very familiar. That puppy feeling. I imagine it's something akin to having a baby for the first time, though I imagine in that scenario the feeling is multiplied. A nagging uncertainty. Did I forget something? I am really responsible for these creatures? What, in God's name, did I do? Over the next several days, I checked on them obsessively, refilled their water, cleaned the poop from the feeder which they insisted on defecating on. I held them; they squeaked and desperately tried to free themselves from my grasp. And then...there were 5. On Wednesday afternoon I popped my head in and noticed one of the black striped Ameraucanas (future layer of blue eggs) on its back, the others, walking right over it. It even had poop on its breast. I uprighted it and toweled it off, hoping it was just the victim of temporary hazing. But that was the beginning of the end. It could barely hold its head up, later, it couldn't stand. It stopped eating - changing its mind only for a little bit of homemade mash I prepared it. Did I mention it was a hard boiled egg? The chick's last meal was a hard boiled egg. Troubling. I gave it a separate little box and spoon fed it, dipped its beak in water, hoping it would drink. It panted, nodded its head, and fell back down. Friday morning the bird was dead. I cried. Big tears. Did I kill the bird? G buried it for me where the old owner's dog is pushing up daffodils. I won't cry the next time. Or at least you won't know that I cried. There will be a next time, that I am sure of. This is only 'introduction to farm life', after all. I pondered the thought while eating an egg, over easy on toast with steamed spinach. It was from my neighbor's chickens, and it was unlike anything you'd find in a supermarket - delicious with its bright yellow yolk. I hope for a similar bounty - plentiful, fresh, eggs, and a vigorous compost from all that poop to help out the vegetable garden. The economist in me asks why I couldn't just keep enjoying the neighbor's eggs --that would be easier, more efficient, and certainly less heart wrenching. But that's not all of me. A friend often says she needs to do more things that scare her. Getting this close to the dirt, scares me. Yesterday I picked up 3 more chirping future egg layers, and I have 2 more coming next week. Double down. You can't call me chicken -- not anymore.